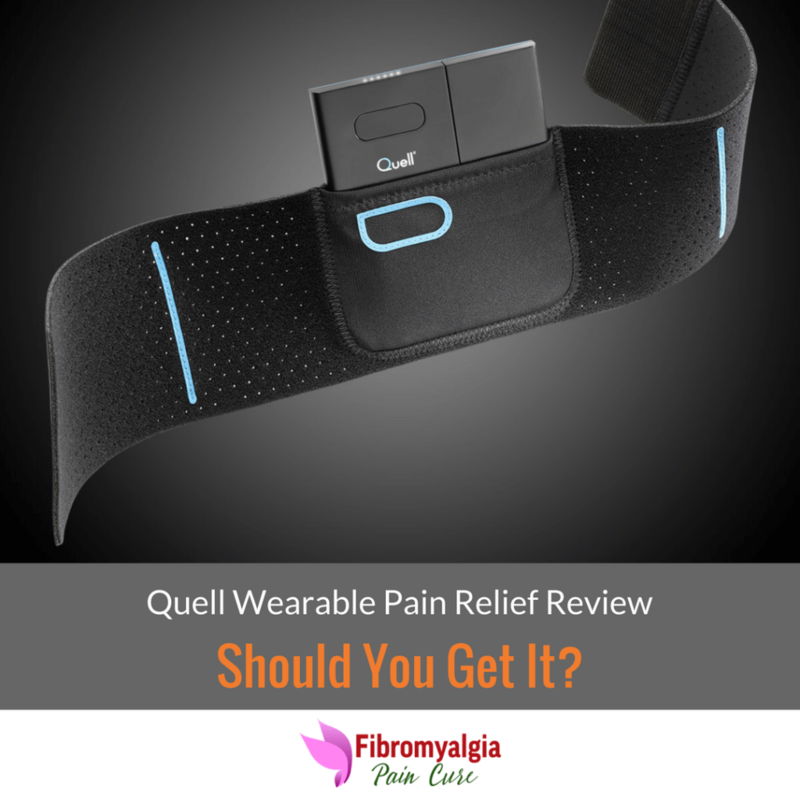 →Quell Wearable Pain Relief Review: Should You Get It? This is NOT a sponsored review. It is an unbiased third-party review of the device, written in order to educate consumers on whether or not it is a good product for them. It is effective in relieving chronic pain, but some people reported to have no change in their pain. The device is FDA approved and have no side effects. It is expensive as starter kit and is not covered by the insurance. But the device comes with standard risk free 60 days warranty. It is easy to use and has a maintenance free operation. There is no learning curve involved and the operation of device is simple but some users may find it difficulty to adjust. Support options are either through call or online. It is easy to get hold of customer support and helpful in resolving any issue. Is Quell Covered by Insurance? Should you buy Quell wearable pain relief device? Over 100 million people worldwide suffer from some kind of chronic pain condition. This not only disrupts their daily activities but also deteriorate their quality of life. The most common treatment for chronic pain is pain relieving prescription drugs. But these drugs often have side effects. There are several reasons to have chronic pain ranging from illness to injury. Nerve Pain: Medical conditions such as diabetes, sciatica, and shingles often causes nerve pain. These pain may also happen in the absence of any particular disease. Treatment of specific medical condition such as cancer may also cause nerve pain. Leg and Foot Pain: Various Neurological and Musculoskeletal condition such as neuropathy, sciatic nerve pain, and restless leg syndrome may cause severe chronic leg and foot pain. The pain usually occurs under the hip area through leg, knees, and ankles to the feet. Fibromyalgia Pain: Fibromyalgia flares causes widespread body pain including muscular pains. The pain usually spread all over the body and has some tender points int he muscles and joints. People often feel deep, aching, radiating, shooting or sore pain. Arthritis and Joint Pain: Over 25 million people in the US suffer from Osteoarthritis, and around 1.5 million have rheumatoid arthritis. Rheumatoid arthritis is an autoimmune disease and can cause severe painful inflammation. These inflammations may occur not only in the joints but also other internal organs. This results in swelling, and increasing stiffness in the hands, knees, and hips. Lower Back Pain: Lower back pain can result due to physical issues such as herniated discs or injury such as an accident. It is often dull, constant ache to a sudden sharp sensation. The shooting pain makes it challenging to stand up. NeuroMetrix, located in Waltham, developed Quell as a spinoff project of Harvard-MIT Division of Health Science and Technology in 1996. NeuroMetrix founded by Shai N. Gozani, M.D, Ph.D., is also a president and CEO of the company. The main focus of NeuroMetrix is a development of products to manage chronic pain, neurological and sleep disorder. 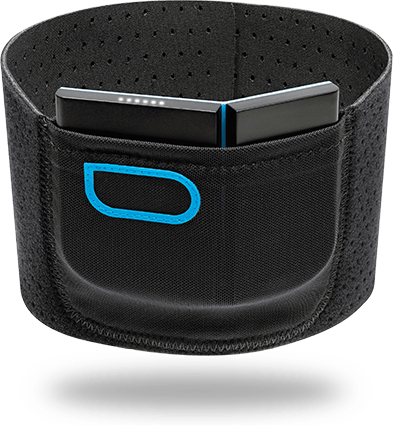 Quell's Indiegogo Campaign: " The World's First Pain Relief Wearable" launched in 2015. It raised over $400,000 with over 2,000 backers supporting the product. The use of Indiegogo funding helped the company to gauge the interest of the users. The campaign received thousands of feedbacks which NeuroMetrix used to refine their product. How Does Quell Wearable Pain Relief Work? A Quell device attached to the body send a well calibrated electrical signals. Each individual needs determine the required dose of electrical signals. These signals range from an occasional session of 60 minutes followed by 60 minutes of rest. 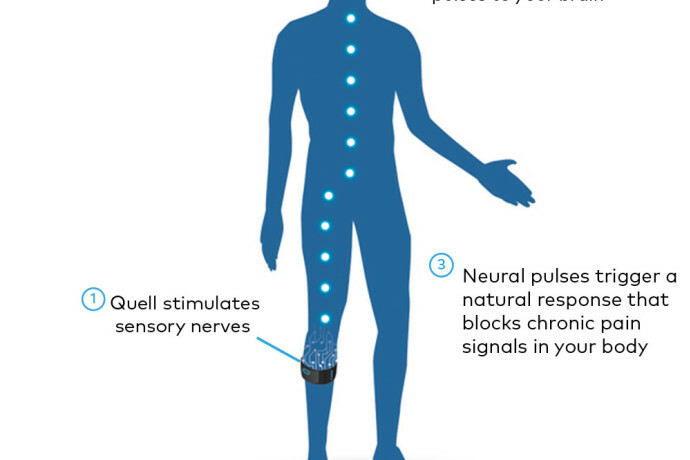 Quell's electrical stimulation blocks the pain signal from reaching your brain. It works by delivering exact high frequency, high voltage electrical stimulation in right level over the time. The body reacts to these electrical stimulations and releases endogenous opioids into the spine. These opioids have pain relieving properties which reduces the pain. Once stimulated, these endogenous opioids last fro 40 minutes after stopping the stimulation. Due to natural pain relieving response by the body for at least 40 minutes, Quell need not to be activated at all the time. Users can turn it on and off as they need it throughout the day. This intermittent stimulation process allows the opioids to keep working for longer. Once the opioids reach the baseline stimulation level, it stops automatically to avoid overstimulation. 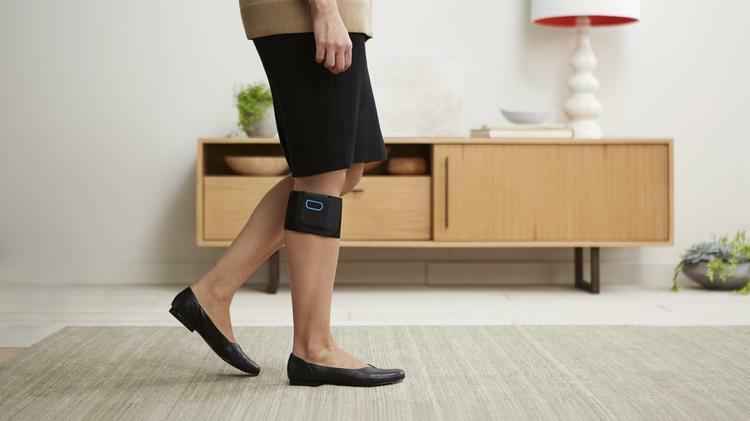 The Food and Drug Administration has approved the Quell Wearable Pain Relief device. It has received 510(k) clearance - class II medical device for chronic pain relief. Quell is a 100% drug-free device intended to provide assistance from chronic pain. One benefit of using Quell is that you do not have to wear it around the pain generating area. You can put it on where you feel comfortable, usually below your calf, and the device will provide pain relief all over the body. When you put it on for the first time, you have to calibrate the device. You do this by testing the vibration intensity of the device and then pressing the front button when you start feeling the light tingling. Quell is based on the Transcutaneous Electrical Nerve Stimulation (TENS) technology. TENS is a safe, non-invasive and easy to use treatment option to get relief from chronic pain. In basic operation, TENS deliver electrical stimulation to the underlying nerve via electrodes. Electrodes are placed near the source of most pain. The development and application of TENS are based on the Gate Control Theory. The fundamental premise of the Gate Control Theory is to stimulate the large-diameter (A-beta) nerve. Once stimulated these nerves activate inhibitory interneurons in the spinal cord. These activated neuron then block the transmission of pain signals. In other words, the TENS activates the sensory nerve which closes the pain pathway in the spinal cord and blocks the pain signal to the brain. There are several TENS device available in the market. They differ in the frequency, amplitude, pulse width, and waveform of the electrical signal. 1. High-Frequency TENS: Frequency over 80Hz. Enough intensity to produce a comfortable tingling sensation. 2. Low-Frequency TENS: Frequency less than 10 Hz. Intensity is enough to elicit muscle twitching. It is also known as acupuncture-like TENS. It produces a slow but long duration of pain relief. The studies conducted on TENS so far has remained inconclusive. More research is being carried out to enhance the mechanism of TENS pain relief process. There are no serious reported side effects of TENS. Some people have reported minor skin irritation which goes away itself. 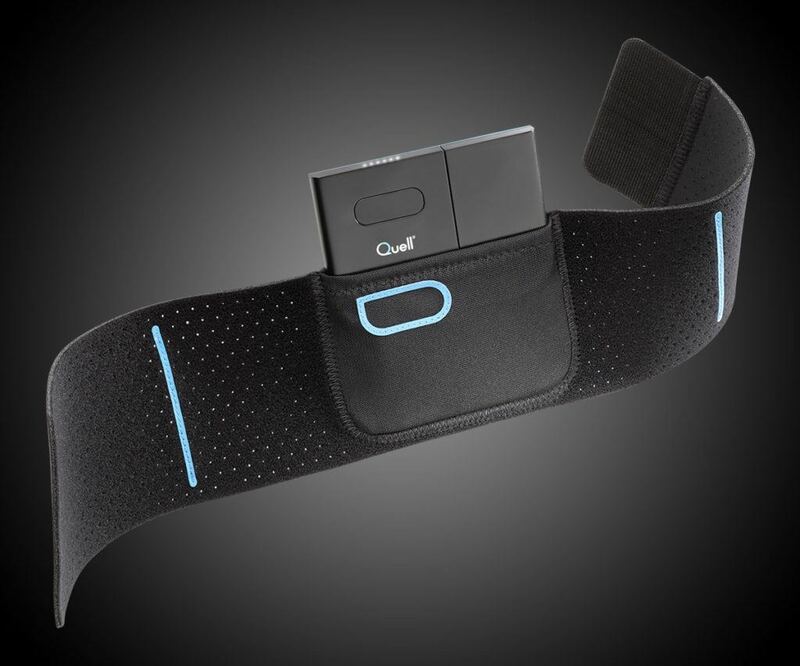 Quell call itself wearable intensive nerve stimulation (WINS) technology. It claims to have five times the strength of other TENS device in the market. One drawback of the above TENS devices is that it has to be worn closer to the pain generating area. In contrast, Quell can be strapped to the calf where there are lots of nerve endings. It is also convenient to wear at the calf to provide full-time pain relief. Quell is very portable with its sealed battery design and encased electrodes in a single unit. It is quick to recharge and comfortable to wear as compared to other battery operated TENS unit which has long wires and bulky electrodes. Quell recommends the device to be used for a couple of days to see results. But many users have reported getting pain relief from the first day of use. The most significant advantage of using Quell or other TENS device is that it is entirely drug-free. The use of pain-relieving drugs often has a dependency issue and severe side effects. In a clinical study, 130 participants with chronic low back pain treated with FS-TENS for 60 days. FS-TENS uses high-frequency transcutaneous electrical nerve stimulation. At the end of the trial, 80.7% participants reported reduced pain with no side effects. If you have fibromyalgia condition, you will be more interested in knowing whether it will work in your case. The simple answer is "it depends." Now I am sure that is not the answer you are looking for. But there is no sure way of knowing that it will work on you. And the reason is the way Quell works and your own body itself. Quell provides relief from chronic pain related to a Neurological and Musculoskeletal condition. Fibromyalgia is one of the symptoms with similar characteristic. Quell will work to relieve those pain which is due to those conditions. But it will not provide relief from other fibromyalgia symptoms such as a headache, migraine, sleep apnea, etc. So if you have a fibromyalgia condition, then pain is the biggest challenge you have to deal with. Now any help which will reduce your pain will improve your quality of life. Many users have reported Quell to be effective in reducing the pain, but it will not make all the pain to go away. Quell works well for pain related to sciatica, fibromyalgia, diabetic neuropathy, and osteoarthritis. These pain conditions are generally caused by the musculoskeletal condition. The effect of pain reduction is immediate unlike taking pain killers which takes some for medicine to take effect. However, Quell is not very efficient when the weather-related fibromyalgia is triggered. You have to supplement with some pain killer for a relief. Quell comes in small size rechargeable devices. It is larger than playing card but half as thin. You can order Quell through Amazon or from Quell Stores. It comes with standard 60-days money back guarantee. The packaging of the product is spotless. It gives the impression of a high-quality product. My only complaint is that it comes with a velcro band and the electrodes feel little bit substandard. You can also download Quell app from Android and Apple Store. You pair Quell with your smartphone app through Bluetooth. You can also track the treatment time, battery life and sleep quality. The lightweight and comfortable design of the device makes it easy to wear under the cloth. It is comfortable enough to wear even when you are at sleep. You have to replace the electrodes once every two weeks. The electrodes used in the Quell uses hydrogel that wears out from repeated use. Even if you have to replace the electrodes, it will be still cheaper than buying prescription medicines. Most of the times these prescription medicines are not only expensive but also have several side effects. Use of Quell is hassle-free and straightforward. Follow the simple four-step process to be up and running with Quell. 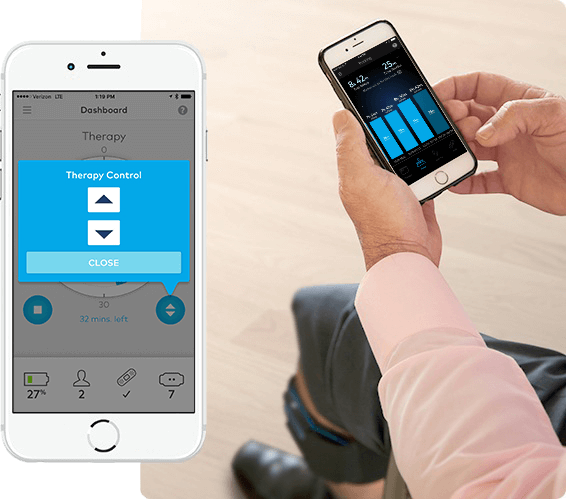 Quell’s OptiTherapy technology automatically adjust the intensity of electrical stimulation to keep you comfortable while providing enough electrical stimulation to provide pain relief. On the first use, you hold the button on the Quell device, and you will see the lights running back and forth. Every time you feel a slight buzzing sensation, you click the button once which will pause the sensation each time you click the button. When the sensation starts again, click the button again. Repeat the process 3-6 times, and when the calibration is complete, the light will turn off. Keep your legs flat on the floor during the calibration process otherwise it will not be accurate. During calibration, you may also experience intense stimulation which may be a little bit painful. Once calibrated when you click the front button the sensation will increase by 2 minutes. It will stabilize after reaching optimal intensity.If you find the feeling to be strong, then you can decrease or increase the intensity. Each therapy lasts for 60 minutes. Typically the session will continue until the device is removed from the leg or manually turned off. Quell does not have any moving part and it is a sealed unit which means it is not meant to be user repairable. Quell has a rechargeable battery which when completely charged last up to 40 hours in the optimal condition. The unit comes with a charger and a USB cable which you plug into the device and to the electrical outlet. A white indicator light will turn on when the device is charging. The number of lights shown will increase as the battery charges. When the battery is totally charged, in approximately 3 hours, all five lights will be lit for a short time and then turn off. You can clean the device with a moistened cloth and hand wash the band. Quell recommends removing the device and electrode every 4 hours, so the gel on the electrode has time to re-set. The device is not water or sweat proof so you should not take a shower wearing the device or do a heavy exercise where you will be sweating a lot. Quell is comfortable and safe to use overnight. When you are ready to go to bed, you can either turn on the device manually or through the app. In the sleep mode, the first therapy session will start at the normal intensity level. Then later sessions will start itself every other hour for the rest of the night. When you are at a deep sleep stage, the device will lower the power to not disturb your sleep. You can also change the sleep setting to manual mode. When setting in a manual mode, you can choose light intensity mode so you can fall asleep. If you have mild or severe pain, then you can leave it at full intensity mode. The light on the device will show you the energy level. One light means bedtime energy, two lights for gentle overnight strength and three lights means full power. The Quell App is optional and is not required for the use of the device. 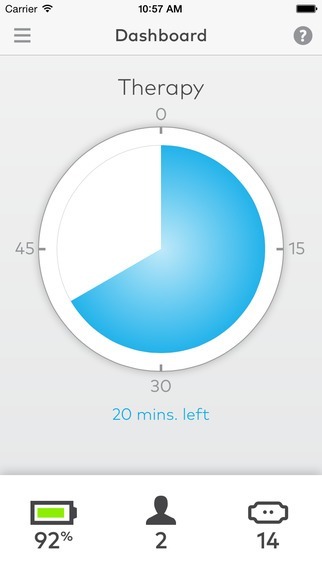 The purpose of the app is to provide information about the therapy, device status and controlling the treatment level. The Quell App is available for both Apple and Android smartphone users. You install the app on your device by searching “Quell Relief,” and you will see the app from NeuroMetrix, Inc.
You have to turn on the Bluetooth device on your smartphone before you install the app. Follow the instruction on your screen to install the app and pair it with your device. You can use the following functions from the Quell App. The Quell app is frequently updated to add new features and improve the stability of the device. Quell app is only available to Android and Apple smartphone users. You can purchase Quell through Amazon and Quell store. At the time of the review, the started kit was priced at $249. This is not a low price when compared to other TENS devices. You also have to change the electrodes every few weeks will be an extra recurring cost. Each electrode cost $29.95 for a single unit and $84.95 for a three-month supply. Many users have reported that the velcro band gets worn out after using it a couple of months. Then you have to buy a new one which cost $25.95 each time. It appears that Quell has purposely designed their product in such a way to have a recurring sale of electrodes and velcro band. However, on their product page, they claim to be working on the product quality. FDA and Health Canada has approved the sale of Quell, but it is not covered by the insurance yet. Quell claims to be working with regulators and insurance companies to get it under the Medicare coverage. One possible alternative may be to claim it under the flexible spending account (FSA) or Health Saving Account (HAS) program. If you qualify under those programs, then you may get reimbursed of the purchase price. 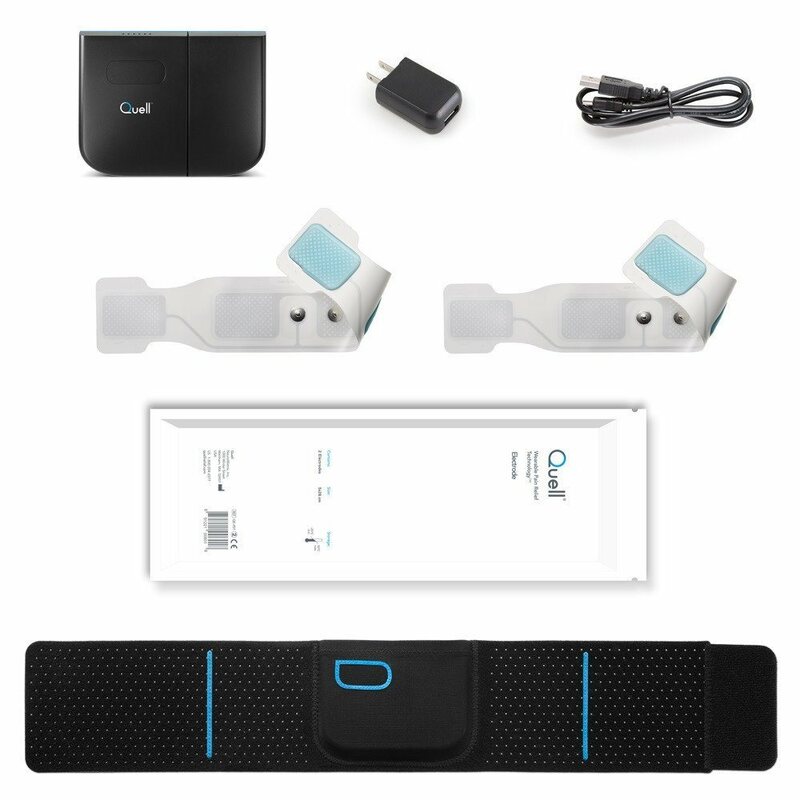 There has been a mixed review from the users of the Quell Wearable Pain Relief device. Many users reported that they found significant relief when they first started using the device. Some users also reported that relief did not happen after using it for two-weeks. (Source 1, Source 2, Source 3). It is possible that a limited number of Quell users have developed stimulation thresholds to block the pain. Our body and brain always adjust itself to adapt to the changes occurring internally and externally. However, the majority of users has a positive experience using the device. It is unfortunate that currently insurance or Medicare do not cover it. But this comes with 60 days return policy and two-year warranty. So if you are not satisfied with the desired result, then you can return it. The biggest positive thing using Quell is that it is 100 percent drug-free and there is no significant side effect. The initial high cost of purchasing the device and recurring cost of electrode purchase will be offset by the cost of buying painkillers. At last, Quell will not cure your fibromyalgia condition, but it will help to reduce pain associated with fibromyalgia. Unlike prescription painkillers, you will not develop dependency or have withdrawal symptoms. You should consult your doctor if you use a Cardia pacemaker, implanted defibrillator, or other implanted device. Quell may interfere with the general operations of the above devices. 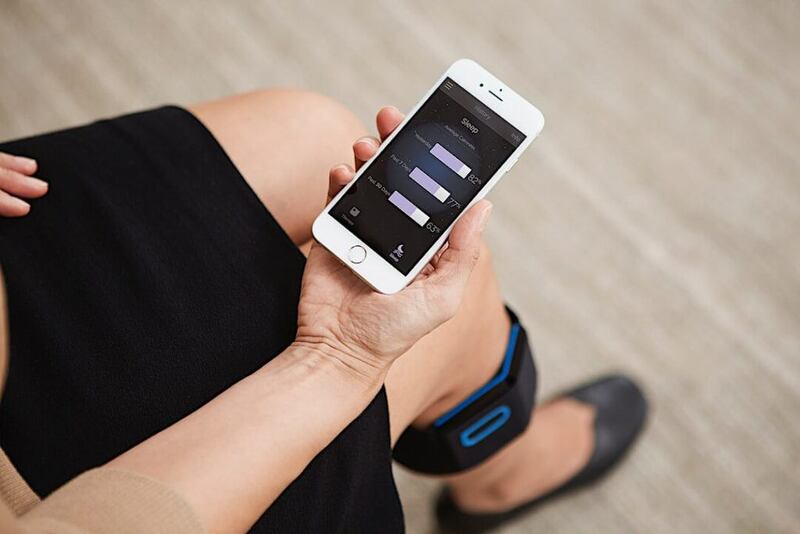 Have you used Quell Wearable Pain Relief ?